We finally had decent water levels to fly fish for muskie so my fishing partner Andrew and I headed out to our favorite muskie water. The forecast called for partly sunny skies, with a high temperature of 45° and a low of 37°. The water temperature was 41° degrees and we were hopeful the December "Super Moon" would have the fish on the feed. I started working over a deep pool that had a downed tree on the opposite bank. This was the site of my first big muskie earlier in the year. Every cast and retrieve brought me visions of that huge fish inhaling my fly and I was begging the fish gods for a repeat of that day. After twenty casts and retrieves I had no action. My good friend Andrew finished his coffee and peanut butter and jelly sandwich and decided he would work the tail end of the pool. He threw his 12” fly to the opposite bank and in three strips was greeted with a hard take of a hungry muskie. The 40” plus fish thrashed and fought and ended up throwing Andrew’s fly. We were both dumbfounded at what we had just experienced. The “fish of 10,000 casts" was hooked up on Andrew’s first cast of the day, but these fish give no quarter and despite his disappointment, Andrew went back to fishing. I decided to move downstream about 50 yards, making sure I gave Andrew room to fish. This stretch of water held fish months earlier and with near perfect water level and clarity I was excited at the prospects. With every cast the visions of that huge muskie filled my mind when suddenly something big violently struck my fly. I set the hook hard, and without hesitation, I heard a loud crack that closely resembled a .22 rifle shot. My rod snapped in two pieces and I saw my top section being taken into the deep pool by a large fish. I had to react quickly and chase down the rod before it sunk into the murky depths. I pulled the fly line until I felt the weight of the heavy and now irate muskie. The giant Allegheny River muskie that snapped my fly rod. I was now in a battle of tug of war with the fish as Andrew watched on. We both equated it to an episode of Swamp People where they are trying to land angry alligators by hand. After several minutes I was able to tire the fish out and pulled her close enough to where I reached into the water and cradled her like a baby and carried her to shore. Andrew and I couldn't hide our enjoyment at what just went down but in the excitement I realized my Hatch reel and bottom section of my broken rod were somewhere in the now muddy water. Fortunately, Andrew was able to find it and we both laughed out loud. The monster from a different angle. The fish measured 47" and we guessed her weight somewhere in the 30-pound range. We took some pictures, made sure she was ok and then released her back to her home. What a fish and my personal best! We were one for two in the first half hour of fishing and we were both pumped to say the least. I needed to get my back-up rod from the truck and catch my breath so Andrew continued to fish. He fished the same stretch over and over but had no follows or takes. He switched flies and fished the pool again, but still no fish, so we headed a quarter mile down river to the next productive area. This area has deep channels with big boulders and these boulders break the current so the fish will hold tight against them to ambush prey. I lost two muskies in this spot during the late summer and I also had one go airborne trying to hit my fly. As with the first spot, I was very excited and optimistic we would get some action. 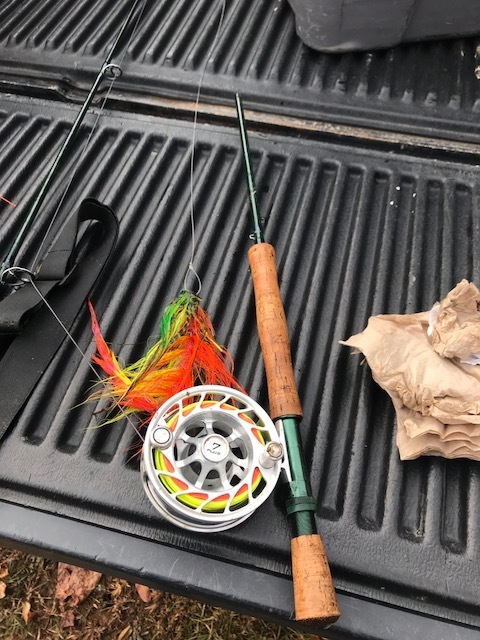 A picture of my broken fly rod. Andrew started fishing the bottom of the pool and I fished the head of it. We hammered every inch of that water and couldn't move a fish. We both switched flies and tried different retrieves in an effort to get a strike from one of the fish that we knew were there, but nothing. Since it was getting late in the day, we decided to go back and fish the area where we started in the morning. 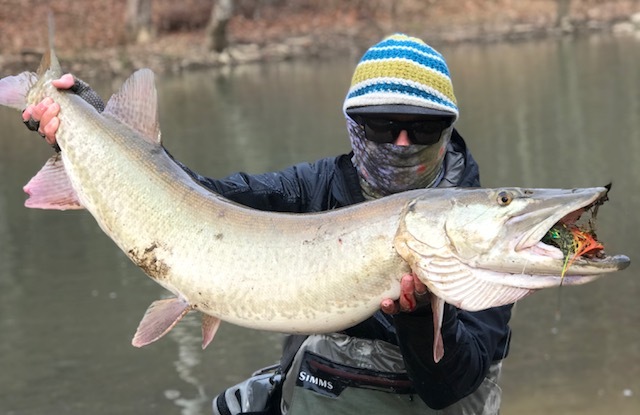 The second muskie I caught on the Syndicate. fter a few minutes of fighting, the fish was beached and I had my second 40" plus muskie of the day. My rod survived the encounter but my fly wasn't so fortunate. The head of the fly and the front hook were damaged so extensively that the fly needed to be sent back to the fly guy for repairs. Such is muskie fishing and I'll gladly trade a broken rod or a damaged fly for a couple of these magnificent fish. My crazy expensive fly that is going back to the fly guy!